Sports Costs > How Much Does a Home Gym Cost? Because many people cannot afford or find the time to join a gym, an at-home gym may be a better option. This allows you to work out in the comfort of your own home and at any time of the day or night. The most basic type of home gym is a simple weight bench with free weights. A weight bench alone can cost between $50 and $200. Some of these benches are just flat padded benches, while others have multiple reclining positions to allow for different types of workouts. Buying the weights separate from the bench will cost between $15 to $350 depending on the style and the number of different weights. Something simple, such as the Hausmann vinyl coated dumbbells, can be purchased individually for around $5 per weight or in sets ranging anywhere from $20 to $50 per set. 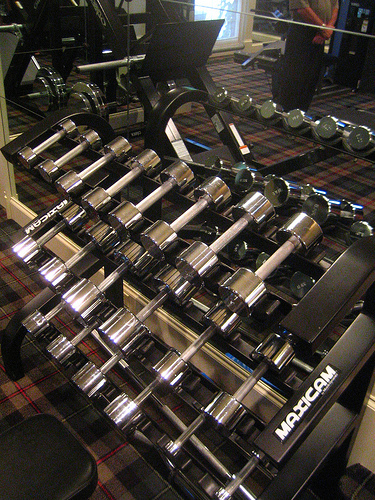 More expensive dumbbell sets include the Stamine Versa-Bell II, a set of adjustable dumbbells sold for about $160, or the Hex dumbbell rack which can be purchased for about $360. The next level of home gym is a weight bench, which uses fixed weights and cables to build muscles using a variety of different workout options, can be found for $250 to $1000 on average. For example, the Best Fitness BFMG20 can be found for about $400, while the Powerline BSG10x will cost about $850. Another type of home gym uses tension wires instead of fixed weights and cables. These gyms include the Bowflex PR1000 and PR 3000 which sell for $500 and $800. These tend to be all-in-one systems and won’t require anything else. A new type of home gym that is becoming more and more popular is an over-the-door system. These systems are great because they take up very little space in your home while still allowing for a very versatile workout. These systems can cost $30 to $200 and include something as simple as a or as complex as the Body by Jake Tower 200 which is sold for about $150. According to this top answer on this Reddit thread, he had paid $1,000 for his treadmill, and his bench, rack, weights and preacher bar cost about $1,100. If purchased online, be prepared to pay shipping fees for weights that weigh more than 50 pounds. With heavier sets, shipping fees can easily get into the $100+ range. Flooring is ideal for those who want to put it on a concrete floor or a harder floor. This special home gym based flooring is going to protect the floor underneath it from scratching. Flooring can start at $25 and go up from there. Experts recommend either installing plywood or rubber mats. Different brands of gyms can come with additional DVDs and instructional guides that can help with workouts. Some brands may come with an initial copy, but additional copies can be extra. Training shoes are highly recommended when working out. A good pair can cost upwards of $80 to $125. A dip belt, which can help overload your dips, can cost about $30. Those who work out in a garage often decide to caulk or insulate their garage door. This type of project could cost $100 to $250. Before you purchase the equipment, make sure that you know what kind of training that you want. You’re going to want to know what kind of equipment is right for you. Commit to working out. It’s wise to purchase some sort of time clock that can help manage your workouts for you. Create a schedule throughout the week and make sure that you stick to it. Try to work out at least every other day. Some of the benefits? You no longer have to wait for equipment, don’t have to pay for a gym membership and you have the freedom to do what you want. The downfalls? It may require more discipline as you don’t have anybody to motivate you. Plus, there won’t be a spotter unless you have someone over to help. Lastly, most homes will require more space. Speaking of space, most people will convert their garage or basement into a gym. 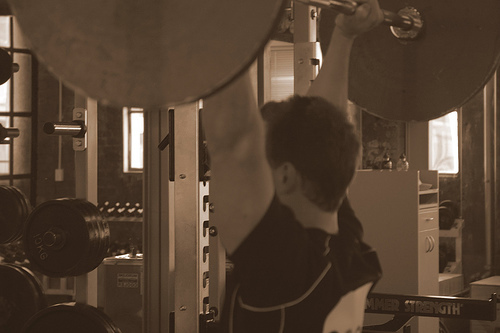 Generally, you will need about 125 square feet at a minimum to create a functional gym. At a minimum, experts recommend you have at least an Olympic weight set, squat rack, weight bench, dumbbells and a heavy-duty floor mat. Cardio machines can get expensive, and if you don’t have the room, consider either a rowing machine or something as simple as skipping rope. Used home gyms can be found for much cheaper through websites such as Amazon, eBay, or Craig’s List. Purchasing in person can save you in shipping fees. Since some weights can cost more than few hundred dollars to ship, local stores won’t charge this shipping fee.